It's not just about punching in Batman: Arkham City; it's about the punching and questioning. The annoying thing about criminal thugs is that it can be hard to tell which ones you need to talk to and which ones you can safely punch into unconsciousness. That's not going to so much of a problem in Arkham City though, because Batman has gained the ability to spot a rat from fifty paces. Arkham City's game director Sefton Hill said that the Riddler's challenges would be making a return from Arkham Asylum, but wouldn't rely on maps to show the location of the biggest secrets. Instead, the only way to get the information would be to squeeze it out of one of the Riddler's henchmen using the new interrogation mode. You won't be able to put the pressure on any old goon though, as only specific enemies have any useful knowledge. Batman's detective mode will be able to detect which foes will talk, but you won't be able to get anything out of them while their friends are still conscious. Hill said that it added an extra element to the game's combat system, as rather than pounding anything that moves, you had to be careful to leave the informant standing. Presumably, the Riddler's puzzles will be extras, just as in the first game, so you're not going to hit a brick wall if you accidentally knock out an enemy who had information. I'd be surprised though, if there wasn't at least one instance of interrogation in the game's main plot. After all, dangling people from buildings until they tell you what you need to know is a very Batman-y thing to do. 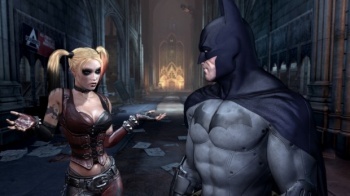 Batman: Arkham City is scheduled for release in next Fall.